How much is shipping and when can I expect my parcel if I placed an order today and live within the USA? Is the Irritable Cream a moisturiser? I have just purchased a tube of the Irritable Cream. How long until I see results? All USA deliveries are charged at $6.50 (flat rate) and you can expect your order to arrive within 2-4 working days. We dispatch within 24 hours of receiving payment. If you are located in Canada shipping is estimated online, as you go. However, we do subsidise the shipping for you in an effort to keep costs down. We use USPS for all international orders and ask you to allow up to 10 working days for delivery. 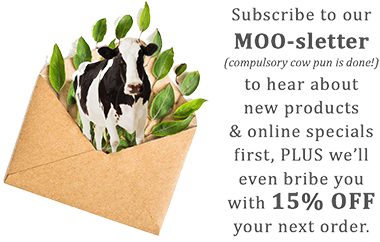 All MooGoo products should last 24 months if stored under 30°C, away from sunlight. We have the products independently tested (a British Pharmacopeia Preservative Efficacy Test) to make sure they are sterile. This is very important as our products are often used on children or people with broken skin and contaminated products can be dangerous. We use an organic preservative system in all of our creams except for our Eczema Balm which has different requirements as it is a therapeutic product. Our Irritable Creams and Oil cleansers do contain Essential Oils which some internet sites do suggest avoiding during pregnancy. However this usually refers to aromatherapy or applying the oil directly to the skin. However it is personal preference and the MSM Soothing Cream would make a good alternative to the balm and our Milk Wash is a fantastic facial cleanser. If you have an allergy to Milk Protein (rather than Lactose) you may want to choose creams without Milk Protein. They include the Irritable Cream, the MSM Soothing Cream and the Scalp Cream. Eczema can be thought of as an allergy that breaks out on the skin, often starting with small red bumps and spreading with an itch. There is more information on our website under “Eczema”. Your doctor will provide information and often prescribe a cortisone based anti-inflammatory cream. This can be very effective at bringing an acute breakout under control, but there are limitations for longer term use as discussed with your health care professional. Our Irritable Cream is also anti-inflammatory and has helped allot of people get this condition under control. It can be used as often and for as long as needed. Although the Irritable Cream has some moisturising oils, it is not specifically a moisturiser. The Irritable Cream is a topical treatment to be applied to affected areas. As Eczema and Psoriasis are both dry skin conditions the balm works great in conjunction with a moisturiser. Our MSM Soothing Cream is ideal as it has high concentrations of MSM, a well-known soothing ingredient, great for Eczema. Everybody is different and results do vary but you should be seeing an improvement within a few days of use. The cream acts as an anti-inflammatory (Eczema is an inflammation of the skin) as well as controlling Seborrheic Dermatitis. As with all natural products, we suggest you patch test first. Cradle Cap is the infant form of Seborrheic Dermatitis. There is more information about this on our website under “Eczema”. Cradle Cap is normally very easy to control. We would suggest our Irritable Cream and our Scalp Cream is also designed for dry and flaky scalps. You can then use when needed throughout the day. Our shampoo is another option (especially if your little one has a lot of hair) and will help control the micro-flora of the scalp. It is extremely gentle and safe for babies. If you have any further enquiries, don’t hesitate to get in touch via our contact form.